unrecognizable now is an occasional collaborative project of Matt Jones and Marcus Fischer. 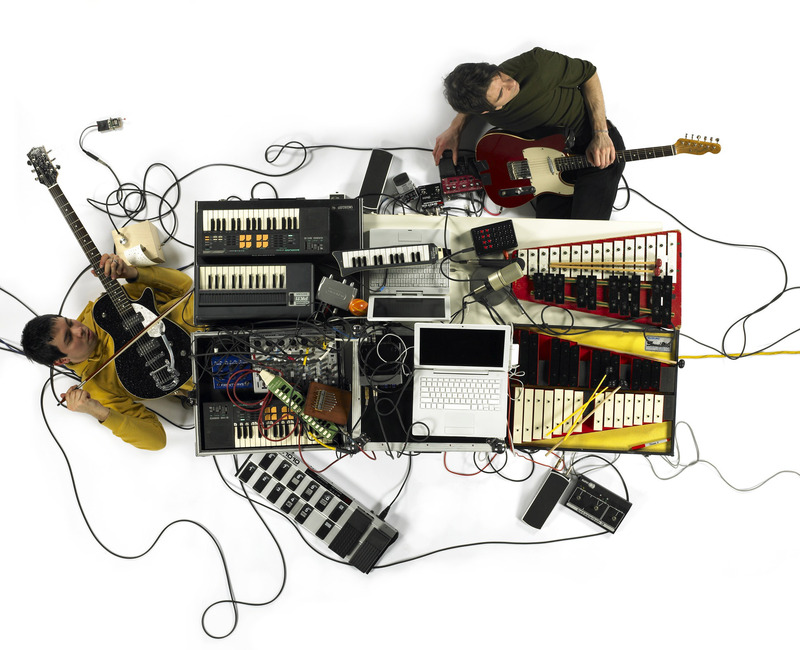 They consider their work to be “gradual layered music” based on live improvisation, found sounds, a range of instrumentation, and laptop computers. In 2004, Jones and Fischer scored various experimental films by Portland, Oregon filmmaker Rob Tyler. The relationship of sight and sound was further explored by Fischer, Jones and Tyler in the first of a series of events in 2006 entitled Vision+Hearing. Fischer and Jones released their debut CD in a cave or a coma in mid-2006 on the Pehr Label (with 10 tracks and a short film by Tyler). In 2008 a live performance of unrecnow was captured on self-released limited edition CD entitled for sleeping it off. Marcus Fischer is a well known solo and collaborative sound artist, to date releasing more than ten recordings on labels such as 12k, Tench and Flaming Pines. Matt Jones is a photographer, artist and sculptor. Both are based in Portland, Oregon. While two rooms is a further exploration of the electro-acoustic improvisation realm, this project also seems to nod to earlier works like Brian Eno’s seminal Ambient 1 – Music For Airports (1978) and the somewhat darker Ambient 4 – On Land (1982). unrecognizable now including a diagram of how the music was recorded is not unlike diagrams included on the reverse of both of the noted albums by Eno. This release is not only the literal music recording, but an in-situ analysis of how and why it exists as it does. Not a “field recording” per se, rather an interior anti-studio recording, one where it is important to document not only the music, but the ambience of the setting as well as the process. 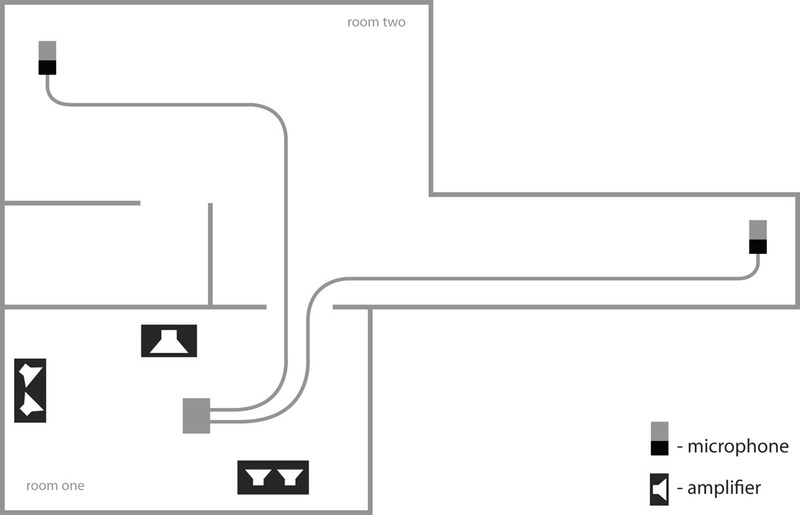 The microphone placement for two rooms (in the basement of a downtown Portland office building), with the varying distances from source material and varying sound decay rates gives a tangible sense of space. This treatment also counters a sense of claustrophobia that one might expect, being recorded in a concrete tomb, of sorts. It has a remarkably expansive sound (historical note: the vocals for the David Bowie song Heroes were recorded using a series of remotely placed mics similar to this). Since this is a live improvised recording, it includes all the sounds associated with movement and production of the work by the artists (walking, changing instruments, etc. ); adding a sense of transparency and intimacy. The progression of this work is similar to Fischer’s recent 16 minute live release EP At Frame. Non-representational yet (depending on the listener) it can evoke memories or visions. For me, parts are like being on a sailboat, anchored or just drifting in light wind, and at others like wandering through an old dark factory and wondering about the history of the place. two rooms has the pleasant effect of allowing the mind to wander while occasionally being nudged by recognition of a particular instrument in the soundstage. The feeling in Track 1 is largely one of comfort. This section is more guitar and string-based (with some bowing) with pedal effects. Track 2 transitions to more keyboards, and then strings blend and the sound is fuller and brighter. After a graceful lull, deep and gentle waves begin at about the midpoint. There is a slight recurrent low-register plucked-string theme and then one is cast adrift at about 9:00. Track 3 is more ethereal than the other parts, especially at the beginning. Guitars return again at 1:30 and are blended into the omnipresence. At about 3:00 the density increases and bowed strings return to then be consumed into a cavernous silence. Late in this track there are various percussive effects to announce the transition to Track 4. This section is plucked, strummed and somewhat simplified; in a sense returning to the beginning and later an overlay of a nearly hidden repetitive melody appears and vanishes as the piece closes. 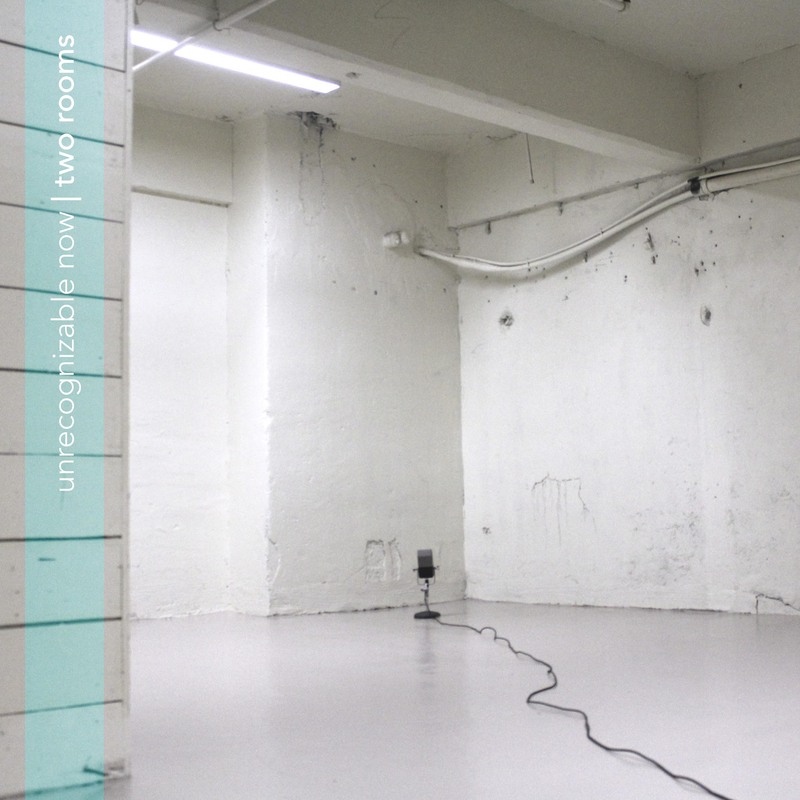 two rooms will be released on July 16th and digital files will be available for download, but if you are so inclined for a physical release, there will soon be 300 CD copies available in numbered and letter-pressed recycled card sleeves and related artwork—reasonably-priced, for such a beautiful work of sound art. This is an intriguing exploration of sound and space (an interior “field recording” of sorts), evoking different images and experiences. Perhaps now, rather than incidental music to a short film, this piece could be the creative inspiration for a visual work of its own. *Postscript on the forthcoming remixes – More information on these soon (to be released on July 28th), but the Simon Scott remix is taken from the second half of Track 2 (one of my favorite sections) and finishes with the sound of a vinyl runout groove. Given Simon Scott’s recent work on his Below Sea Level project, I can see why he would be attracted to what I think is the most marine-like section of this work. The Kane Ikin remix has mysterious origins (to be discovered by the listener) with added treatments and loops. This is a solicited review, although I have the physical release on pre-order. This entry was posted on July 10, 2012 by wajobu. It was filed under Uncategorized and was tagged with 12k, AffordableAudio, Ambient, Audiobulb, Audiokarma.org, Daily Audiophile, Darla, Drone, ElectroAcoustic, Electronica, Experimedia, HifiZine, Instrumental, Kane Ikin, Kesh, Keshhhhhh, Marcus Fischer, Matt Jones, Music, Simon Scott, Solo Andata, tench, two rooms, unrecognizable now.